Kawasaki Ninja 1000 Forum > Kawasaki Ninja 1000 General > Ninja 1000 Parts & Accessories > accessory recommendations please - GPS tracker, throttle assist, etc. accessory recommendations please - GPS tracker, throttle assist, etc. I am interested in the bike mounted version as a theft recovery option, however the main goal is that my wife can check in on a whim and see where we are. We currently use Life360, however she's complained several times that she'll call me and it says I'm in one place when I am in fact in another. Generally, it hasn't updated at that point. (one time I was in a bad cell area and it showed me in the middle of a field for a half hour so she got worried because I also wasn't receiving calls) It has also failed to update correctly while in areas with strong cell reception. 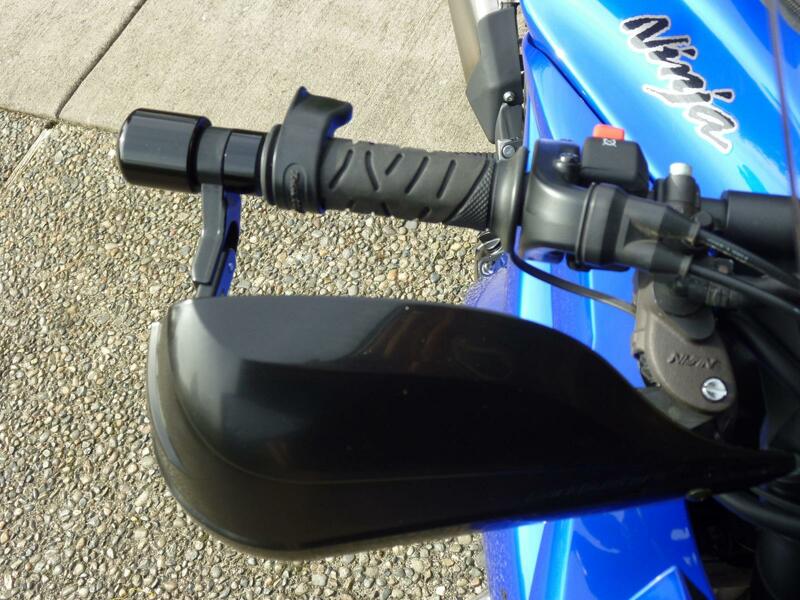 Throttle assist - not necessarily the throttle lock variety, more the kind with a plastic loop and shelf that reduces the need to grip the throttle lever so hard. I've found a few on amazon, but many reviews indicate breaking within a few days... One day I may spring for the Kaokao, but I don't necessarily want to drop over $100 for that atm. Also, any comfort or piece of mind accessories not commonly mentioned? When a man says he will fix something, then he will fix it. There’s no need to keep reminding him every 6 months. I have the Crampbuster from Cyclegear on both of my bikes. It can be a little annoying around town but definitely a plus on the highway. The trick to adjusting is spinning it around backwards so I recommend practicing a bit before taking the bike out. It could be a tad smaller but it does what it is supposed to. I'm more interested in the GPS tracking app/devices. Anybody? I picked up the little "cramp buster" item shown on a used bike I bought 20 years ago or so. It's soft rubber and adds just enough leverage to relieve the hand. It doesn't get in the way, doesn't ding the tank at full lock and, with time, becomes so automatic you only notice your right wrist isn't sore at the end of a long day. I have no idea where to get one. What kind of hand guards do you have there? I'm thinking of installing some on my ride. REVER works pretty good. Not hard to plan a route if you subscribe, and by the year cost very little, there is a free version also but you dont get all the features of course. Also use WAZE, it is a social based app that is damn good around here for avoiding performance awards. As for a throttle lock I use a Go Cruise. They are Barkbuster Storm S7s. They mount with the single screw at the end of the handlebar. You remove the weight, replace with the Storm mount. All the parts come. I found a bit more vibration in the bars so added the weights back. You have to buy longer bolts to do that. Last edited by kenors; 04-02-2019 at 07:20 PM. Throttle assist -- I've been using BrakeAway, which can be tedious to install/tune, but once it's set, it's great. That being said... I had Throttlemeisters installed the heavy ones. I bought them to help make my hands stop falling asleep due to high frequency vibration I didn't realize this bike has. My hands no longer fall asleep. 110% worth it. If you're coordinated enough to use a twist throttle lock, just use these. I'm not, so I still use the BrakeAway. GPS -- Garmin Zumo, it's made for the job. Mine's mounted with the bracket that uses the gas tank bolts. I bought it after seeing that the google maps don't work when there's no cell service. Rever has new features and claims to be usable without cell service, I haven't tried it. So far just using them to track rides. I just got back from a 6-day ride, 1800 miles. Enjoyed how the bike is set up. Thank you for the various recommendations on throttle assist. To clarify once again, when I say GPS I don't mean navigation. I mean something that my wife can check to see where we're at when I'm on my rides.